Glittering stars shine over the fire pit. Savor the rolling mountains before you as you soak in the hot tub. Will an epic game of pool be in your future? Gem stone mining, hiking, and rafting are all convenient to the cabin. 4 Bedrooms & 3.5 Baths: The main floor bedroom has one queen bed with a TV, a mountain view, and a private bathroom with garden tub and stand alone shower. There is a half bath on the main floor. The second bedroom is on the upper level and has one queen bed. The third bedroom upstairs has two twin beds. There is a bathroom down the hall with a tub and shower combination. The fourth bedroom is on the lowest level has two full beds and has a mountain view. There is a bathroom and laundry room past the game room on the lowest level with a shower stall. Put some steaks on the grill as you gaze out at the mountain tops and chill the bottles of wine for your peaceful retreat far away from the rest of the world. Head down to the game room for a fun game of billiards on the full size pool table, then take two steps out the door and soak in the soothing hot tub as your eyes soak in the amazing view of starlit mountaintops and the amazing brightness of the stars above. For reviews please click on the Reviews Tab. 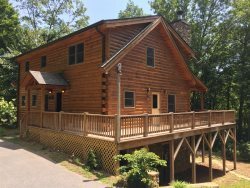 "The cabin was perfect for our group of six adults. We were able to access the cabin in 2WD vehicles and although arriving to the cabin for initial check-in prior to dark is recommended and would be ideal, we arrived at night and did not have any major issues navigating the mountain roads to the cabin. The layout and furnishings of the cabin provide various spaces for privacy or for guests with different interests. The open layout of the kitchen, dining area, and living area is ideal for group gatherings. And the cabin is an easy, approximate 25-minute drive to Harrah's Casino. We definitely enjoyed our stay at this cabin and will be keeping it in mind for future trips!" Thank you so much for the hospitality. We enjoyed ourselves very much and we will be back again soon. Great View! Great Family Time. We will be back. The description of the home was spot on, the host rep contacted me prior to arrival to confirm all was good (we had not made it to the home yet), offered her services until 8pm that evening, nothing was left out of the listing - great family location, great end of summer getaway! We had a wonderful family get together at this cabin! The cabin was all that we could ask for. Amazing views! This was well enjoyed by all. Thanks for sharing your amazing cabin with us. First time to NC-What a great area. Had lots of fun enjoyed the food , loved the cabin with the awesome views. Glad to spend the time with my husband, son and family. Hope to do this again soon. We had a wonderful family meetup. We loved the cabin and amazing view. We enjoyed spending time in the local towns. We love the area and will definitely return. Had an amazing time here this cabin. AMAZING VIEW!!! I love spending time with my family. Can't wait to come back and make more memories and more adventures. BEST 4th of July ever. Wonderful cabin. Beautiful view! Enjoyed spending time with family and friends for the celebration of our daughters wedding at Betty Creek Vineyard. Everyone that I spoke with was friendly,knowledgeable, and professional. It is an amazing cabin and great location for the casino. We had a wonderful birthday weekend! Great Cabin. Wonderful Views! We had a great time.